Kofi Annan is Secretary-General of the United Nations. In 2001 he was awarded the Nobel Peace Prize personally and jointly with the United Nations as an organization. 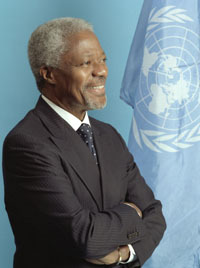 As Secretary General , Mr. Annan has given priority to revitalizing the UN through a comprehensive programme of reform; strengthening the Organization’s traditional work in the areas of development and the maintenance of international peace and security; advocating human rights, the rule of law and the universal values of equality, tolerance and human dignity; restoring public confidence in the Organization by reaching out to new partners and, in his words, by “bringing the United Nations closer to the people”. The Secretary-General has also taken a leading role in mobilizing the international community in the battle against HIV/AIDS, and more recently against the global terrorist threat. During the last 10 years the UN has faced many severed difficulties such asfinancial crisis,renewed terrorist threatsand unrelenting pressure from the US and other major powers. However despite thisKofi Annan has proved an innovative and independent Secretary General. He has worked hard to promote the fundamental values of the UN -advocation ofhuman rights, humanitarian aid and collective security.